In the near future, Major (Scarlett Johansson) is the first of her kind: a human who is cyber-enhanced to be a perfect soldier devoted to stopping the world's most dangerous criminals. When terrorism reaches a new level that includes the ability to hack into people's minds and control them, Major is uniquely qualified to stop it. As she prepares to face a new enemy, Major discovers that her life was stolen instead of saved. Now, she will stop at nothing to recover her past while punishing those who did this to her. The Ghost in the Shell 4K Ultra HD, 3D Blu-ray and Blu-ray Combo Packs are loaded with over 50 minutes of fascinating special features. Scarlett Johansson, director Rupert Sanders and other cast and crew take you behind- the-scenes to talk stunts, special effects and intricate fight sequences. Plus, take an in-depth look at the real-life science behind robotics; discover how cyber-enhancements give each character specialised super–soldier abilities; and learn about the original anime as well as the inspirations behind the visually stunning view of the future. The 'Ghost In The Shell' competition has now closed. Winners will be announced shortly. Competition opens at 5pm AEST on Sunday 23rd July 2017 and closes at 11:59pm AEST on Sunday 30th July 2017. Five winners will be chosen at random on Monday 31st July 2017. To successfully win, entrants must fulfil the above entry conditions before the time the competition closes. Current members/followers are eligible to enter the competition. Only one entry per person. Only one winner per household. To be a valid winner, the entrant must not have won a prize from SWITCH within the last 28 days. Each winner will receive one Blu-ray copy of 'Ghost In The Shell'. By entering, you agree to receive occasional emails from SWITCH in the future. If you decide to unsubscribe from these updates, any further entries will not be applicable. Only Australian residents are eligible to enter. 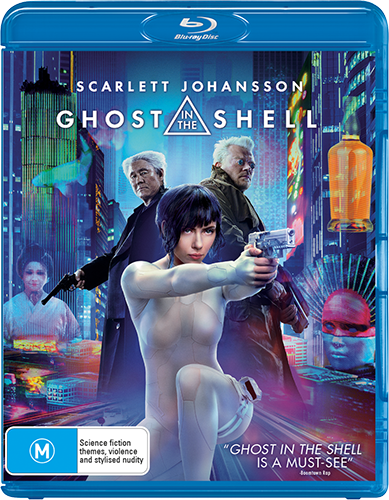 'Ghost In The Shell' is available on 4K Ultra HD, Blu-ray, Blu-ray 3D and DVD on Wednesday the 26th July 2017 from Universal Sony.